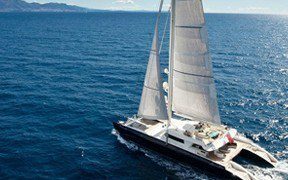 The luxury catamaran charter fleet ranges in length from the awe inspiring, Pendennis built 44m HEMISPHERE which takes up to 12 guests in mega comfort with 10 crew, to ‘purpose built for charter’ 12m cats taking up to 8 guests with 2 crew. 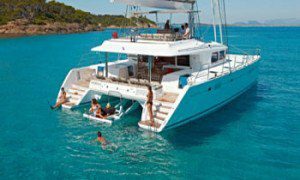 In between these is a whole range of superb catamarans offering idyllic charter holidays. Our selection is made up of those that best represent each category. The 17m – 23m range is very popular with many excellent examples of various yacht designers. 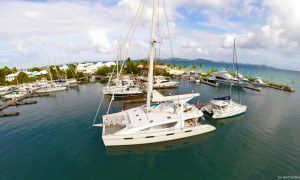 They boast a vast array of creature comforts – bars, jacuzzis, high speed fishing tenders, watersports facilities second to none and scuba diving equipment. The crew are highly professional and skilled and love to teach their guests a new water skill or help you relax with a massage on deck before serving exotic cocktails at sundown and dinner under the stars. 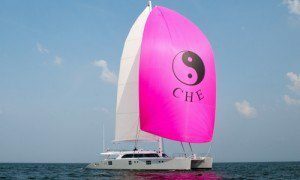 Consider chartering a Catamaran for space, stability, modern design, equal cabin arrangements and accommodations. 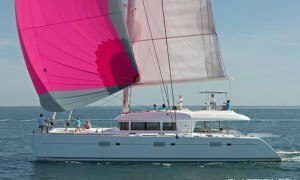 Built for comfort and offering a huge amount of space both on deck and below, a catamaran provides stable and easy sailing and a host of places to enjoy the ocean from. Lying on the ‘trampoline’ on the foredeck, watching dolphins play below or sitting up high on the Flybridge deck feeling like the king of the world as you twist your way down wind. The shallow draft makes them perfect for sliding up close to the islands and hovering over turquoise sea while at anchor. Nothing can better the sensation of being on a privately chartered catamaran at anchor in a moonlit bay while dining under the stars. They are particularly popular for cruising islands surrounded by shallow water such as atolls and sandy cays. Think Virgin Islands, Tobago Cays, Leeward Islands, South Pacific, Maldives, Bahamas. 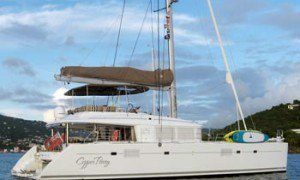 76' (23m) Catamaran. Built 2013. 12 guests. 4 crew. New England, Caribbean. 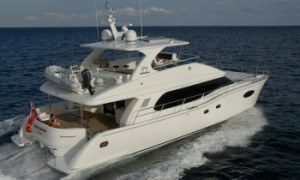 From $46,950 - $49,950 pw. All inclusive. 67' (20m) Catamaran. Built 2015. 10 guests. 3 crew. Caribbean, Caribbean Virgin Islands. From $39,000 - $49,163 pw. All inclusive. 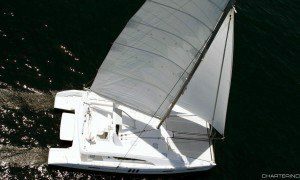 62' (18m) Catamaran. Built 2014. 12 guests. 3 crew. Caribbean Virgin Islands , Caribbean Leewards. From $31,000 - $41,400 pw. All inclusive. 62' (18.9m) Catamaran. Built 2015, CNB Bordeaux. 8 guests. 2 crew. Caribbean and West Mediterranean. From €23,000 - €33,000 pw. All inclusive. 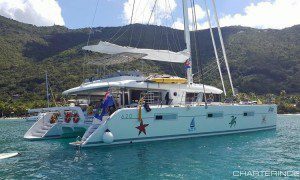 56' (17m) Catamaran. Built 2012. 10 guests. 2 crew. East Mediterranean, Croatia. From €12,000 - €25,000 pw. All inclusive. 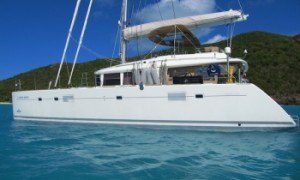 56' (17m) Catamaran. Built 2011. 6 guests. 2 crew. Caribbean and the East Coast of North America. From $19,900 - $30,500 pw. All inclusive. 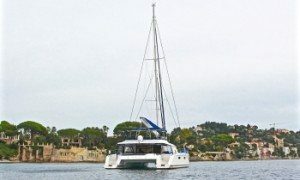 56' (17m) Catamaran. Built 2011. 6 guests. 2 crew. Caribbean Virgin Islands, Bahamas. From $21,900 - $28,500 pw. All inclusive. 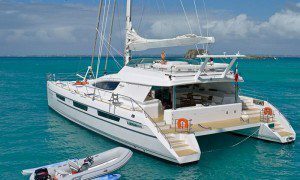 60' (18.2 m) 2013 Horizon 60 power catamaran. 6 guests. 2 crew. Caribbean Virgin Islands. From $22,000 - 29,500 p.w all incl. 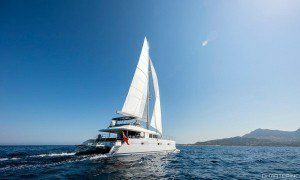 If you are interested in finding out more about our carefully selected catamaran fleet, please get in touch and we’ll be delighted to send you further information. Not all the fleet is shown on our website as some exclusive details, PDF’s, itineraries and rates are ‘on request only’.